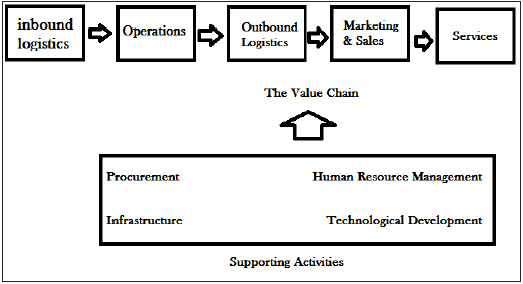 The value chain concept is based on the process view of organizations. It is an idea of considering a manufacturing (or service) organization as a dynamic system, made up of various subsystems each with inputs, transformation processes and outputs. The inputs, transformations, and outputs require the acquisition and consumption of company resources, such as money, equipment, materials, labor, buildings, land, administration and management. The management process of carrying out value chain activities determines the costs and affects the profitability of organizations. Most of the organizations in the real world engage in hundreds, even thousands of activities while converting its inputs to outputs. These activities are classified as either primary or support activities. Inbound Logistics − Inbound logistics refers to the terms with the suppliers and includes all of the activities needed to receive, store, and disseminate inputs. Operations − Operations refer to the entire activities needed to transform the various inputs into outputs (the products and services). Outbound Logistics − Outbound logistics include all sets of activities needed to collect, store, and distribute the output. Marketing and Sales − Marketing and sales include the activities to inform buyers regarding the products and services, induce the buyers to purchase them, and enable their purchase. Service − Service refers to those activities needed to keep the product or service functioning effectively after it is sold and delivered. Procurement − The inheritance of inputs or the various resources for the firm. Human Resource Management − The activities involved in recruiting, training, improving, compensating and also dismissing personnel. Technological Development − The equipment, hardware and software, processes and technical knowledge involved in the transformation of inputs into outputs. Infrastructure − The functions or departments such as accounts, legal and regulative, finance, planning and executing, public affairs and public relations, government relations, quality management and general management.